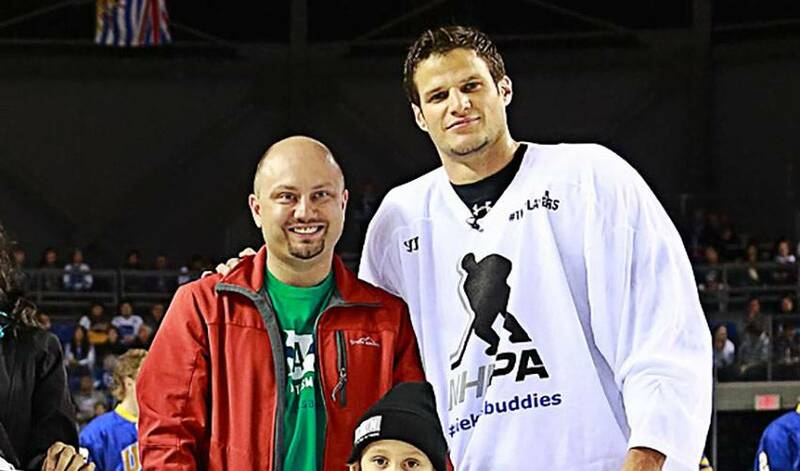 Despite the absence of NHL hockey due to the owners’ lockout, Kevin Bieksa has found creative ways to lace-up his skates, whether it is for charity or to make a surprise visit to a local minor hockey team in the Vancouver area. The 6’1, 198 lbs defenceman is known for his aggressive style of play and fearless approach on the ice, but at the present time, he has traded that tough demeanor for his more charitable side in order to give back to some great causes and to the game he loves. In late September, Kevin, along with teammate Dan Hamuis surprised the North Vancouver Storm midget triple-A team at their practice, participating in drills, spending time answering the young players’ questions after practice and giving them a sense of what it takes to succeed at hockey’s highest level. Last week, Kevin called on celebrity friend, and B.C. native Michael Bublé, to help raise funds for Bieksa’s Buddies at a charity hockey game at the University of British Columbia. In front of a sold-out crowd, Kevin, along with some of his Canucks teammates, as well as other NHLPA members, donned their NHLPA “#theplayers” jerseys en route to a 8-7 win over the UBC Thunderbirds. The event raised an impressive $100,000 which was matched by Bublé for a total of $200,000, with the proceeds going to three charities (Canucks Autism Network, Canuck Place Children’s Hospice and the Canucks Family Education Centre). Kevin is also heavily involved with Mind Check, an organization aimed at raising awareness in support of mental health. After losing close friend and teammate Rick Rypien to mental health issues, Kevin hopes to educate people and help Rick’s memory live on. Kevin’s dedication and involvement to the community shares many parallels to the leadership he demonstrates on the ice and in the dressing room. When the lockout ends, Kevin will look to build off of the career season he had in 2011-12 where he finished second in team scoring among defenceman with 44 points. As a solid two-way player, he is able to shut down opponents in his zone as well as having the ability to join the rush and contribute offensively. Kevin is strong and durable and is heavily relied upon to log large minutes for his team, averaging 23:38 of ice-time last season, second most among Canucks and in the top-30 league-wide.